You’ve seen it—that high-frame rate version of Peter Jackson’s The Hobbit or Billy Lynn’s Long Halftime Walk by Ang Lee. They are great stories. But why do they make us cringe like we’re watching an episode of a British soap opera? And why do we consider that a bad thing? Some viewers prefer it – saying that it gives a heightened sense of realism. We could even argue the benefits of HFR by the Box Office gross receipts. There have been many articles and arguments for and against the visual benefits of it. So it doesn’t necessitate another article unless of course it offers another perspective. The main basis for discussing HFR films has been the total number of images that are viewable during a given time. For example, 60 Frame Per Second (FPS) vs 24 FPS. Does 60 images per second actually give you a more realistic viewing experience? Is 24 more cinematic or “dreamy”? Possibly. I’d like to offer up another theory that the quality or type of viewing experience is based not directly on the total number of frames or images viewed, but rather on the moments between the frames. I love Ferris Bueller’s Day Off. It’s a whacky, fast paced, 4th-wall breaking comedy about a guy (Matthew Broderick) who decides to ditch school for a day of fun. But there is one scene that stops everything and takes a moment to let it breathe. 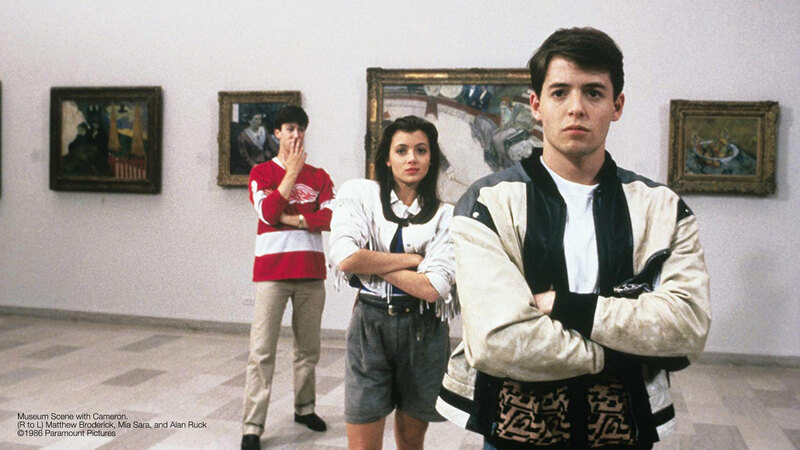 It’s when Ferris and his buddy Cameron (Alan Ruck) go to the museum. While everything is zany and full of energy, Cameron is stuck having some sort of traumatic, perhaps cathartic release staring at an unassuming portion of a painting by George Seurat’s Sunday in the Park. It’s a little girl, often hidden or ignored by most viewers of the painting. That one moment explained not only Cameron’s angst-ridden teenage life, it also explained the crux of the movie. Childhood can be lonely. And perhaps that childhood loneliness extends well into adulthood. Oh God! Who know what Cameron was really thinking*. But he must have spent, what appeared to be, a good hour staring at that one painting. Assuming he viewed it for an hour, technically he was looking at a “film” with a projection speed of One (1) Framer Per Hour (FPH) with the option of viewing it again or moving onto something else. In other words, when Cameron was ready, he could view another frame of his movie in his mind. It is a moment of choice for the viewer. In this case, the viewer is a character in this movie. That’s a bit META, but then so is Ferris Bueller’s Day Off. When we look at a motion picture, we are told frame by frame, where to go. This is true in lower frame rates, but especially true in higher frame rates. Now while I am talking about the in-between frame durations, I am also talking about the in-between moments in general. If you can’t breathe, you can’t taste the food. And just as you need the in-between moments to define both here and there, I am proposing that the duration between frame is as important in affecting the viewer’s experience as the total number of frames (actual images) viewed per second. If we look at a motion picture, say 24 fps, the time between frames is approximately 1/24th of a second, or .041 seconds. For 60, it would be .016. In a HFR movie, we have less time to view and process the frames. This builds a type of psychological resentment as our choice to “move on” to the next frame is dictated by an external source. It is quite possible some people require or want less time to process images just as there are average athletes and the Michael Jordans of the world. On the other hand, you don’t just drink wine. You savor it. You put it in a proper glass, open the bottle and let it breathe; smell the aroma, slosh it around a bit to get a feel for the body. You build suspense about the experience of the first sip. That’s why Hitchcock says to let the viewer know about the bomb under the table before it goes off. You build suspense. And that suspense (or terror, or joyful anticipation) is what I call the true Movie Experience. That movie experience resides in the mind and hearts of the viewer, not on the screen. What do you think that Cameron was thinking in that moment at the museum?